In 2nd grade I used an opportunity afforded during “show ‘n tell” to tattle on my neighbor. We lived on some acreage with horses, ducks, a cat and a dog. Our neighbor would ride his lawn mower around – not mowing necessarily, but using the mower like you might an ATV – drinking beer and tossing his empty beer bottles over the fence onto our property. I’d watch him through the woods. I don’t think he ever caught me catching him. My mother was horrified that I shared that with my entire 2nd grade class, but it seemed noteworthy enough to me. I don’t remember any reaction from my teacher or the class. But it was off my chest and I know I felt better for telling on our beer swilling, bottle throwing neighbor. Show ‘n tell is cool. And fun! I still love it. I’ve got one neighbor still who is very show ‘n tell worthy, but it’s not quite as becoming to tattle on adults as it once was. Businesses desperately need to learn how to show ‘n tell. 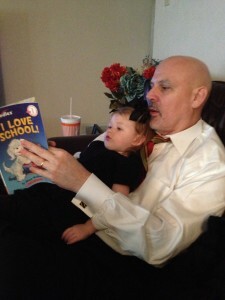 It’s not much different than me reading “I Love School” to my granddaughter. It’s a story. With pictures. And everything. When you’re not quite 2-years-old, you need more than words to keep your attention. And Kinsley, my granddaughter pictured in my lap, won’t let me linger on any single page for much more than 5 seconds. Thankfully, I’m a speed reader (and page flipper) so I can maintain her interest. Your customers and prospects have very similar attention spans. Then again, don’t we all? I guess we’re all battling the ability to maintain focus. We may be smarter than 5th graders, but most of us aren’t able to concentrate any better than a 2-year-old. This makes the skill of storytelling even more valuable. Many businesses, especially what many called “traditional” businesses, don’t do enough work in crafting their story. I didn’t say in manufacturing a story…but in crafting a true, genuine story that is worth telling. In the 2nd grade I knew I had a story that I really wanted to tell. It was interesting to me. My classmates were much like me so I assumed they might enjoy it, too. It had some classic elements. A main character – my neighbor. An illicit behavior – drinking beer. Another illicit behavior – tossing empty bottles into somebody else’s yard. That made the main character, an adult, the villan. Even better when you’re a 2nd grader! Let’s talk about telling a more compelling story so our prospects are engaged enough to do business with us! Jay Leno’s Garage is a YouTube channel that does a great job of telling stories about the cars.